I think we've pretty much all seen the latest development of the main scenario, and again we're left with so many unanswered questions, one of which of course is the identity of the mystery person who talks with Maleficent. People have come up with a plethora of characters it could be, with the general consensus being either Lauriam or Luxu, but I have another idea of who it could be: Invi. I know this sounds crazy and way too out there to possibly be true, because there's not really any indication in the scene that it could be her, but hear me out. First of all, I believe Invi to be the traitor referenced in the Book of Prophecy, and that she has been covertly working with the MoM and Luxu all along. There may be some symbolism in the animals the foretellers are represented by that might not be obvious at first glance. 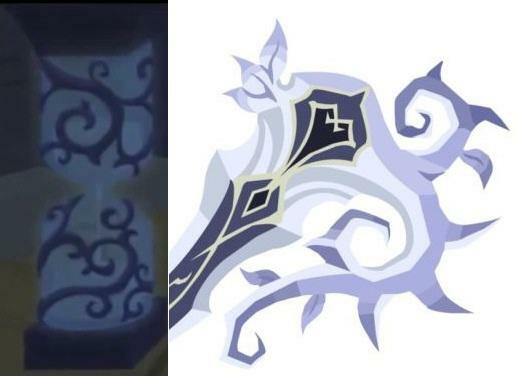 We know Invi is represented by the snake, and Luxu's keyblade No Name has the insignia of a goat on its hilt. The MoM likely represents the deadly sin of pride, and pride is generally represented by a lion. So we have three characters represented by the snake, goat and lion. 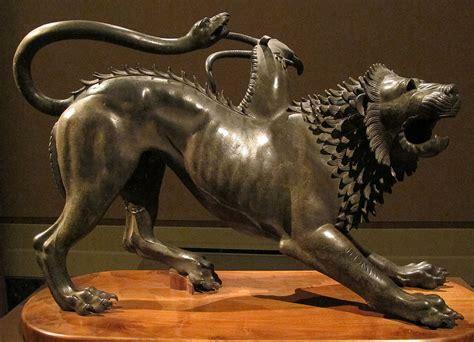 The Chimera is a creature from Greek mythology that is traditionally depicted as a lion, with a goat's head coming out of its back, and a tail of a snake's head. Clever symbolism, or just mere coincidence? Also, if you note, there are two males and one female. 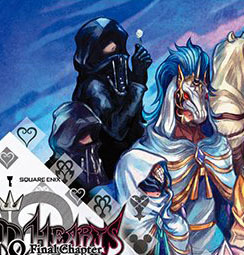 Could MoM, Luxu, and Invi be trio of KHX? Remember that scene in X and UX where Mickey is in Daybreak Town and there's a figure on the roof, watching him? In normal circumstances, only the feet of the figure are visible, but someone found the full image in the browser version's files, and the shadowy figure is revealed to be non other than, you guessed it: Invi. Also, take a look at the cover art for 2.8. Notice how Invi is positioned directly under the MoM and Luxu? 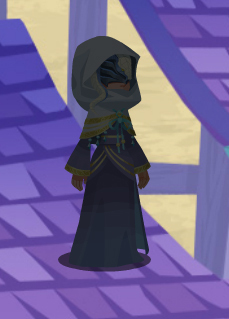 The way her hood is covering her mouth kinda makes her look like she's wearing a black cloak, and she looks like she looks like she could be grouped with both the MoM and Luxu, and the rest of the foretellers. Foreshadowing her role as a double agent, perhaps? With the reveal that the Union X worlds are constructed from data in the latest update, then the library is likely the center of this data creation, and with the hourglasses being a reference to time and time travel, then perhaps Invi plays a large role in creation of the data worlds, and is the one who teaches Maleficent how to travel forward in time? What above all makes me think that the mystery figure is Invi is that the character uses vague pronouns in the Japanese script that makes the gender of the character ambiguous. There are a multitude of characters they could be if they were male, so why use ambiguous pronouns? Because they don't want us to know it's a woman, as that severely narrows down the possibilities. Nomura has had this planned from the very beginning. The clues are staring us in the face. Remember, in Kingdom Hearts, there are no coincidences. Everything is there for a reason. I love this theory, and still a supporter if it, but didn't the Fortellers dissapear after the events of The Keyblade War? That would be a contradictory statement from "darkness"? This chimera trinity idea sounds very plausible. Right now we probably know too little to properly answer these questions but I might as well ask for the sake of conversation. How far back do you think Invi was chosen by Master of Masters to be involved in this elaborate scheme, would he have picked her before or after she became a master? Why do you think she went along with it? She came into conflict with Aced but she seemed to care about her fellow Foretellers, especially Ira, was it all a ruse and she's actually a lying psycho or does she believe she's acting against her comrades for the greater good?